"This is where he wanted to be..."
"This is my happening and it freaks me out!" exclaimed Chaz Ebert on behalf of her husband, Sun-Times film critic Roger Ebert, on stage at opening night of the ninth Roger Ebert Overlooked Film Festival in Champaign-Urbana. The line (memorably quoted by Mike Meyers in the first "Austin Powers" movie) is from the Ebert-penned screenplay for Russ Meyer's 1970 cult classic "Beyond the Valley of the Dolls," which is among the titles in this year's festival. It was Ebert's first public appearance since he suffered complications from surgery last June, and it brought down the full house at the Virginia Theatre in Champaign. As he announced in a message featured in the Sun-Times and on his web site (rogerebert.com) Tuesday, Ebert is not able to speak now, pending further surgery, so Chaz had to do the talking for him. As Ebert wrote on a pad before the screening, "After we go onstage, Chaz will read one line from me that will say it ALL." Chaz recounted how the festival was nearly cancelled late last year, when Ebert was in the hospital and the pace of his recovery was uncertain. But Festival Director Nate Kohn visited Ebert in his Chicago hospital room with a message from Mary Susan Britt, the festival's Associate Director: "The festival passes sold out in a little over a week in November. You have to get out of that hospital bed and come down to Champaign-Urbana." "At that moment," Chaz said, "Roger made a commitment. If it was at all possible, he would be here tonight.... This is where he wanted to be, this is where he is, this is where he's staying," she said, and the crowd responded with a standing ovation. Through his wife, Ebert reminded the audience of the importance of Champaign's Virginia Theatre, the restored movie palace in which the Ebertfest films are screened. "I saw 'Gone With the Wind' here, and my father saw the Marx Brothers on this very stage." And he thanked Britt for helping him fulfill "a lifelong dream -- to have my own La-Z-Boy chair in a movie theater." Ebert will be watching the films with the audience from the recliner in the back row of the Virginia. Instead of the usual Ebert introductions and post-screening onstage interviews with filmmakers, the festival organizers have assembled panels of friends, colleagues and experts to discuss the films with the filmmakers, and the audience, after they are shown. Chaz said there were more guests than ever at this year's festival -- among them directors Werner Herzog ("Stroszek"), Paul Cox ("Man of Flowers") and Andy Davis ("Holes"), actor and longtime festival attendee Scott Wilson (with "Come Early Morning"), actor Alan Rickman ("Perfume: The Story of a Murderer"), and actress Fatoumata Coulibaly ("Moolaade"). At a reception at the home University of Illinois President Joseph and Mary White before the first film, Davis's 1997 "Gattaca," President White reminded U of I alumnus Ebert that "Tonight's film may have been 'overlooked' by many, but not by me. I've seen it 12 times." White commended Ebert for his statement published earlier in the week. "Roger said it's about time we talk about the difficulties we face in life -- like illness." 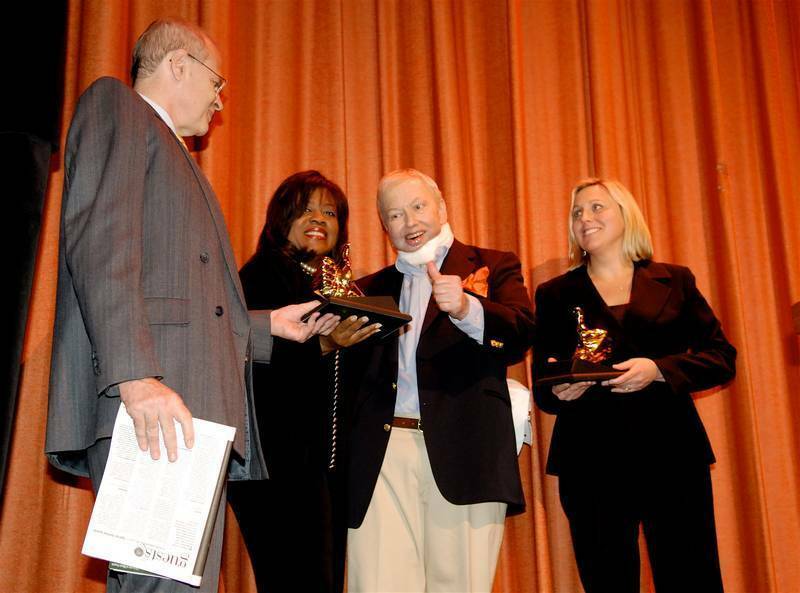 But on this occasion, he said, "The most important thing is to welcome Roger Ebert home to Champaign-Urbana." Introducing his film "Gattaca," producer Michael Shamberg told the crowd, "Roger Ebert represents not only film but the love of film, and not only the love of film but a love of the moviegoing experience.... Nobody has been more important in telling americans why we should love film than Roger Ebert."